The draw for the Women’s European Cup Final will take place on 21 April 2009. However, the home and away rights will not always be decided by draw. The draw for the Women’s European Cup and EHF Champions League Final is scheduled to take place on 21 April 2009 at 11:00hrs in the EHF Headquarters, Vienna. However, the home and away rights of the finals will not be decided by draw in all competitions. A draw will not be necessary to determine the home and away rights for the 2008/09 Women’s EHF Champions League Final. Ateam that had the home right in the second game of its last appearance in a Champions League final will automatically have the home right at the first leg at its next appearance in a Champions League final by considering the order of the years. For the Champions League finals of the 2008/09 season, the seasons 2007/08 (Zvenigorod-Hypo NÖ), 2006/07 (Lada Togliatti-Slagelse DT) and 2005/06 (Krim Ljubljana-Viborg HK) are taken into consideration in this respect in this particular order. The home right shall be drawn by lot in all cases, in which the home right is not defined after having put into practice this regulation point. The 2008/09 European Cup Regulation (point 3.2.1.2) deals with the matter in a parallel way to the Champions League Regulations. A team that had the home right in the second game of its last appearance in a final will automatically have the home right at the first leg at its next appearance in a final by considering the order of the years. For the finals of the 2008/09 season, all club competitions of the seasons 2007/08, 2006/07 and 2005/06 are taken into consideration in this particular order. The home right shall be drawn by lot in all cases, in which the home right is not defined after having put into practice this regulation point. Regardless of the outcome of the semi-finals, the Challenge Cup and the Cup Winners’ Cup home and away rights for the final will be drawn by lots as no team had the home right at the second leg in the past three seasons. 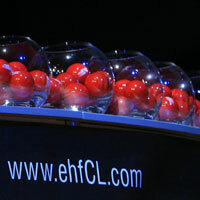 The outcome of the Final Draw will be published on www.eurohandball.com right after the procedure.